Axel Schultz aboard Red Power at the Square Peg Ranch in Half Moon Bay, Calif.
We normally witness the power of the Thoroughbred charging down the stretch, but today we meet a group of ex-racehorses who reveal a much greater power. They're affecting the lives of entire families. 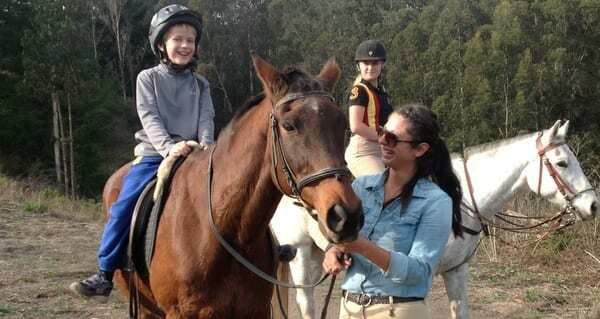 Our Breeders' Cup or Bust tour took us to Half Moon Bay, Calif., home to the Square Peg Foundation, a place that welcomes children who struggle in life as well as the off-track Thoroughbreds who, it turns out, need them. As Scott Jagow reports, to see what happens when these kids – most of them on the autism spectrum – connect with ex-racehorses who are trying to discover their own potential is both remarkable and deeply moving. Square Peg is one of several organizations supported by Breeders' Cup Charities through CARMA. If you can, please donate to the cause. This entry was posted in Ray's Paddock, Videos and tagged Breeders' Cup, breeders' cup or bust, carma, Horse Racing, Off Track Thoroughbreds, Paulick Report, Ray Paulick, Scott Jagow, Square Peg Foundation, thoroughbred, Thoroughbred aftercare, thoroughbred racing by Paulick Report Staff. Bookmark the permalink.